New state-by-state data report finds Ford, Chevrolet vehicles as most popular; Domestics listed as top search in 49 of 50 states. Phoenix, Ariz. (May 18, 2017) —The iconic Ford Mustang is the most searched for classic car, according to a state-by-state report issued today by ClassicCars.com, the premier website for researching and purchasing classic automobiles and trucks. Ford’s legendary “Pony Car” ranked first in 13 states, followed by the Chevrolet Impala (seven). Chevy’s Camaro came in third with five states, the Chevy Corvette, Dodge Charger and the Ford Thunderbird each finished first in three states, according to the site, which registers 330,000 searches daily and three million unique monthly visitors. 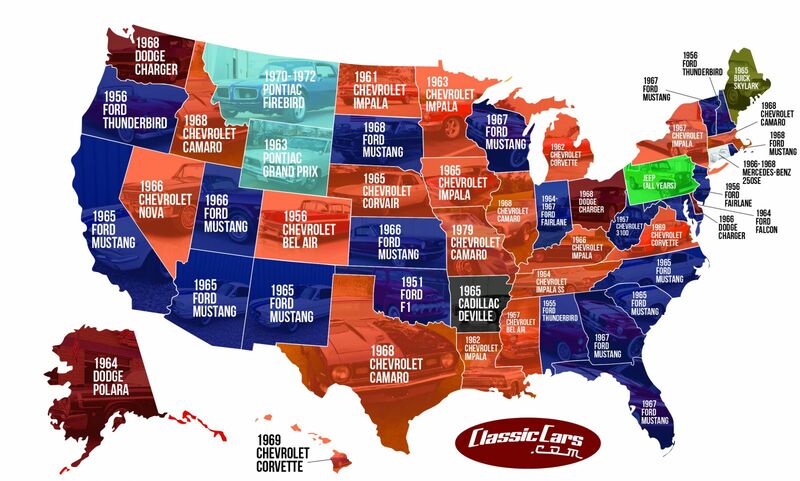 Among makes, Ford and Chevrolet were evenly split, each ranking first in 20 states, ClassicCars.com reports. Overall, domestics topped searches in 49 states, with the lone import-Mercedes-Benz-listed as most popular among Connecticut enthusiasts. While American muscle cars led state-by-state searches, trucks topped the list in West Virginia (Chevrolet 3100) and Oklahoma (Ford F1). U.S.-built vehicles dominated ClassicCars.com’s overall findings, with Mustang generating 3,736,942 unique searches in 2016. Among European models, the Volkswagen Bus was of greatest interest with 240,656, while the Datsun 280Z led Japanese models, at 157,265 unique searches.